Daytime cafe is where diners can enjoy breakfast for lunch or lunch for breakfast. It all started with the coffee. We were immediately hooked. First Watch does coffee right. It’s nice that diners are welcomed with their own pot of the smooth, rich brew. Called Project Sunrise, the cafe notes its coffee is made from Arabica beans handpicked by female coffee growers in the Huila (“Wee-luh”) region of Colombia. First Watch’s menu is also fun to peruse. There’s breakfast and lunch choices for all palates, ranging from rich and hearty to clean and super-healthy. My friend raved over the Trifecta, a “sweet and savory” breakfast treat of two eggs with a Belgian waffle, bacon, and she added a side order of perfectly seasoned potatoes. of organic mixed greens. The burger had a nice spicy kick made from a mixture of brown rice, Peppadew peppers, onions, carrots, and mushrooms. 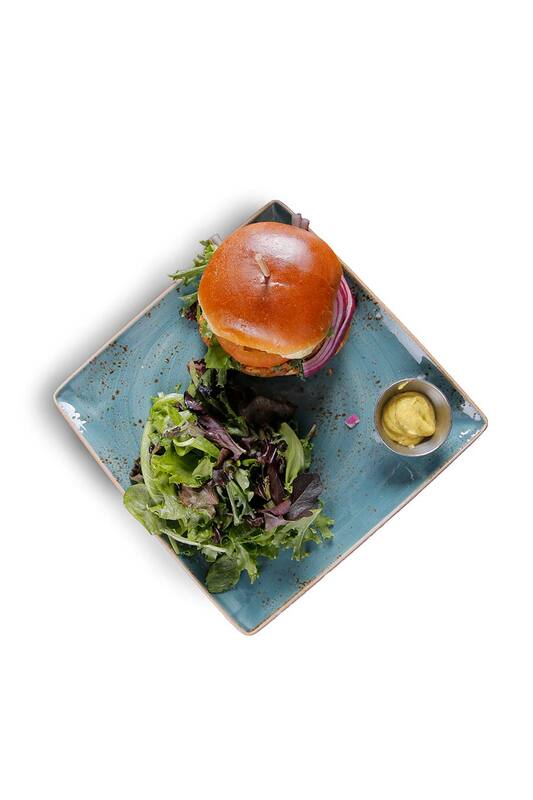 Served on a brioche bun, the veggie burger was topped with mashed avocado, mixed greens, red onion, and a side of Dijonnaise. First Watch won us over. We’re both eager to return and savor more menu offerings. The breakfast tacos of wheat-corn tortillas with scrambled eggs, Cajun chicken, chorizo, cheddar and Monterey Jack cheese sounds yummy to me, and so does the A.M. Superfoods Bowl, featuring coconut milk chia seed pudding with fresh bananas, berries, blackberry preserves, and granola. It’s served with whole grain artisan toast topped with almond butter. Whatever we order next, First Watch’s coffee will be a must. Out-Of-The-Ordinary breakfast and lunch fare: ($2.49-$9.50): Million Dollar Bacon, chickichanga, smoked salmon Benedict, pesto quinoa bowl.